Can I just say that this headline from today’s Personal Journal section of the WSJ had my attention at first glance? It’s this article that has drawn me to sit down and try to reach as many as I can about the potential this simple, yet powerful App could be for all of our family histories. You can read the article written by Geoffrey A. Fowler HERE. Today, as I have barely finished my first cup of coffee, I am bursting at the seams to pass it on. Can I add my own challenge for the upcoming Holidays? This app is free. Let’s all download it and make a point to interview one or more family members. Don’t let it wait for another holiday or think that you will see Grandma so-and-so at Christmas or at least next year. Let’s all take a few minutes out of our busy lives and sit in a quiet room with a family member, look in their eyes, and ask a few questions. Be ready to listen – really listen. You might find that you have given them the biggest gift ever – the gift of your time. You might also find that you have given yourself the best gift ever. Anyone that knows me well, will tell you that I am all about family history. I love the research, whether in a library amongst all the wonderful books, or online while at home still in my workout clothes. I love the family photos that just beg to have their own stories told so that precious snippets in time will live forever. 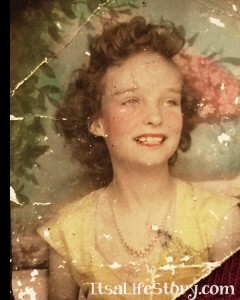 And, I love to uncover family stories that pull all my research and photos together into a powerful legacy. This app, from StoryCorps, might take your upcoming holidays from typical family get-togethers to something that just might live on forever. 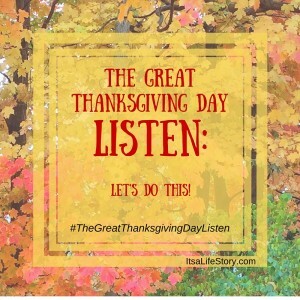 Thanksgiving is traditionally a time to bring families together and this is the Year of #TheGreatThanksgivingDayListen. You can read the story behind it HERE. StoryCorps has been recording family stories since 2003 and they are all “recorded and preserved at the American Folklife Center at the Library of Congress.” This app is a spin-off designed to allow even more people to add to this rich archive of personal/family stories and now we can all join in the fun! The main point of this app is to upload our family stories to be kept within the Library of Congress, but I must say that the biggest turn-off of using some of the other apps was the fact that I didn’t have a choice to keep it private or share it publicly. I know that the idea behind this is to eventually share our family stories for others to listen to, but the feeling of losing control of my story or my family member’s story was enough to delete the other apps off my phone and never use them. Most likely, I will end up sharing all the family stories that I am able to record but it will be at my choosing – and I like that. Let’s all participate in this exciting event! Then please share with me your thoughts. I would love to hear them and together we can discover more and more about the power of what this app from StoryCorps can do to help our own LifeStories live on. How many of you can picture the place in the Wizard of Oz classic movie where it changes from black and white to color? That always seems like the point in the movie where it actually comes to life. I am a fan of some of the old movies but when color is added, it does something that jumps up the enjoyment factor ten-fold for me. That must be why Spring and Fall are two favorite times of the year as far as season beauty goes for me – the Spring flowers and Fall foliage are all considered eye-candy. As you may or may not already know, photos are a soft spot for me and as fate would have it, I have had the great pleasure to help out several people with their family photos – photo restoration and colorization. As far as instant gratification, this field seems to push all my buttons. When I have finished work on a photo, I am busting at the seams to show someone – anyone –that is close enough that I can get to take a look. While I would love to post a tutorial on how to do colorization and photo restoration, it is one of those things that really takes some background knowledge of Photoshop and the willingness to dive into lots of classes and tutorials on best practices in the field. I can certainly point you in the same direction that I took though. For me, it truly combines my love for family heirloom photos, computers, photoshop, and a passion for understanding the importance of a single photo. I have the privilege of being a part of a creative group of women in a Facebook group called The Rising Tide Society. Granted, I am probably on the older side of the group, but I love to read their posts and feed off the energy of this group of young entrepreneurial women. Recently, I received a text from my oldest daughter, also a member of this same Facebook group, that a photo had been posted that I needed to respond to ASAP. Well, it’s hard to not immediately stop everything and take a look at what could possibly be so important and also involved me! The exact moment that I looked at the group’s Facebook page, I knew without even reading further, exactly what she wanted me to look at. There, on my screen, was the most amazing photo of a young girl with beautiful background colors surrounding her. I could feel my heart start to beat faster as I tried to calmly read the request made by the group member. She quite simply asked if anyone in the group might be able to help restore her grandmother’s photo that had been damaged over the years. It didn’t take me long and I quickly messaged her directly that I would be honored if she would allow me to try and fix it. I sent her a link to my website and my email and then just had to hope that she might consider sending it my way. There were so many offers of some wonderful members so I kept reminding myself that she might choose someone else. I literally checked my message box continuously for the next day and a half in anticipation. When I didn’t get any response, part of me was terribly disappointed, but the other part of me still wanted the opportunity to try to restore this beautiful photo and see if I was up for such a challenge. The laugh was on me because she had tried to send the photo immediately and had mis-typed the email address. When she sent it the 2nd time, it was received and I proceeded to plow through and finish my other work so that I could focus all my attention on this project. As I worked through each technique, she began to come to life – quite like that point in the Wizard of Oz movie and I couldn’t have been more thrilled. As you can tell from the picture above, part of her arm had to be restored – not all that easy since she was not looking at the camera directly so one side is definitely different than the other side. But it was really satisfying to see all my little tricks and techniques actually work so well with a little tweaking here and there. That’s the point where my artist/photographer side really came in handy. This portrait was originally colorized and I wanted to keep that feel so I didn’t even try to take it back to black and white and then colorize it myself. I really loved the colors and the softness of the photo. In the original, the left eye was a little red from the “blush” that was applied and I did correct that so that her beautiful eyes could show their sparkle once again. As you can tell, I didn’t change the lips or teeth either. I started to make changes and it seemed to change the look of the photo so, I quickly turned off those adjustments and just left it the way it was originally meant to be. I’m okay with that, since the point of my work on this portrait was only to restore it and not make changes; really, in my mind’s eye it didn’t need any changes. It still has some of the mottled look of the original and I kind of like that as well since it almost gives the illusion of being a very soft painting. What do you think? I wish I knew her story or even her name, but she is hopefully gracing family members as she steps out from behind all the wear and tear to be enjoyed for many more generations. When I look into her eyes, I see the hope of youth and the promise of a life filled with wondrous journeys. These particular photo restoration classes are fairly short but as a warning, you do need to be fairly proficient in Photoshop. That is where all the magic begins and these classes are geared for the more savvy users. Here’s the promised list that I used: “Photoshop Restoration Rescue” by Matt Kloskowski, “Photo Restoration in Photoshop” by Suzette Allen, and “Photoshop Mastery: Retouch and Restore” by Ben Willmore. They all have different techniques but as you will quickly find out, each photo is different in what it requires to retouch it; options, in this case, are a really good thing! If you have a lot of black and white photos, stay tuned because I am going to show you the difference that a little bit of color makes to a black and white — breathing new life into them and helping us to picture them in real life full-color! For those that might have a similiar photo in need of some TLC, go ahead and email me with a snapshot of that photo and I’ll be very happy to give a quote. And if you have had photo restoration done in the past, I would love to hear your stories of the impact of seeing your restored photo for the first time!